Washington State is known for its wood products industries. With saw mills, paper mills, and logging operations located all over the state, logging trucks operate regularly on roads and highways from Longview, Chehalis, Port Angeles, Cle Elem, Seattle, Tacoma, and across the state. Logging trucks pose special problems with their large loads and operations on remote roadways. Like other trucking operators, logging truck drivers and their employers are required to follow the rules and regulations of the road. If a driver fails to obey the speed limit, crosses the center-line, loses a load on the freeway, or otherwise causes a car accident or injury, the person injured in the collision or accident may bring a claim for damages against the logging truck company to get compensation for their injuries. Commercial vehicles such as logging trucks usually carry liability insurance limits of $1,000,000 for each accident caused by the negligence of the commercial trucking company. 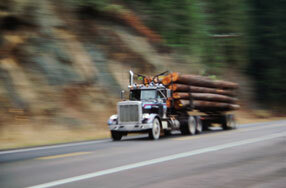 What Compensation May I Recover After a Logging Truck Accident? In a claim against a logging truck company, you may collect damages for medical expenses, lost wages, lost earning capacity, and compensation for pain, disability, and loss of enjoyment of life. The types of compensation available to you following an injury from a logging truck will depend on the specific facts of your case. With over 65 years of combined experience in personal injury claims, our lawyers offer a free consultation for persons injured by logging or other commercial trucks. Call us today for a free case evaluation and to determine whether you have a case. We’re here to provide you the legal guidance that you need following an injury. What Damages are Available for a Wrongful Death Logging Accident? Following a logging truck accident that leads to the tragic death of a loved one, the personal representative of the estate of the deceased person (usually the spouse or child or other family member) may bring a claim for wrongful death compensation against the logging truck company. In such cases, the family has the right to assert damages for (1) pre-death pain and suffering caused by the accident; (2) loss of the relationship between the deceased person and their spouse or child; (3) loss of support to the living family member; (4) loss of inheritance; (5) medical and future expenses; and other damages depending on the specific facts of your claim. In Washington, the law provides a deadline for bringing all claims following commercial trucking or logging truck accidents. All claims must be brought within three years of the collision. While you may have three years to bring a claim, you should think immediately about consulting with a lawyer. In many cases, it is important to conduct a careful investigation while the evidence and witnesses are still available. Cases can be won or lost without this vital evidence. Our experienced personal injury lawyers offer a free consultation for wrongful death claims caused by logging truck and other commercial truck accidents in the state of Washington. Contact us today for your free case evaluation.